A pleasant evening at the Camberwell Squatted Centre in South London last night, spent watching the fantastic Sun Ra film Space is the Place, as well as a short film about the Association of Autonomous Astronauts (AAA). Later I played some of my extensive collection of space-themed music. Last night this included everything from Pharoah Sanders (Astral Travelling) to The Rezillos (Flying Saucer Attack) via Klaxons (Gravity's Rainbow), with some Derrick Carter (Tripping among the stars) thrown in. 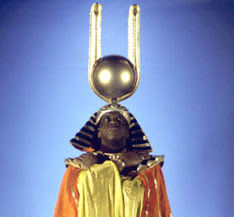 Emerging on the radical fringes of jazz in the 1950's Sun Ra (1914-1993) and his Intergalactic Research Arkestra (as his band was later known) set the space vibe in motion with interstellar explorations like 'Space Jazz Reverie', 'Love in Outer Space', 'Disco 3000', and the film 'Space is the Place' [picture is of Sun Ra in film].